Greg and I both see teaching our children as one of our most important jobs. We think about what we want them to learn from us, what lessons we want them to come away with from their childhood. One of the biggest questions we ask ourselves is, “How do we get this whole ‘love-God-go-to-church thing’ to be more than a routine or, at worst, a resentment? How do we portray it in a way that is real and life-giving?” With a husband in the ministry, I sometimes worry that my children will grow up surrounded by church, but will somehow miss the heart of what God wants for them. Thus, we try our best to teach our kids about God, even apart from the “routines” of church. Part of that teaching consists of our own examples and words, as well as the spiritual practices we try to incorporate into our family’s lives. And part of that teaching comes in the form of educating them about the rest of the world that God loves so much. I would love to get your ideas and suggestions of how to teach kids about the world, and how to show them to live outside themselves. In return, I will show you what we have done so far that has worked for us. Perhaps my favorite “teaching” experience so far has been our Compassion kids. Greg and I first sponsored a Compassion child in 2003, when we first got married. We have tried to get our kids interested in him, but with limited success. It seems that, to them, Duvens is like a distant cousin they have never seen and will never meet. And there is a very good chance that they will never meet him. Duvens is from Haiti, and we really have no connections to that country besides him. Thus, my children seemed pretty indifferent. That all changed when we sponsored two more children this Christmas. We had been wanting to try this for awhile, and the Advent season seemed like a good time to finally do it. This time, I selected a country that we might actually visit one day, as we have missionary friends there. I also explained the idea of sponsoring children to my kids and then let them each pick a child who was their same age and gender. (By the way, Compassion’s website is wonderful. You can go through the whole process of sponsoring a child online now, and it is so easy!) The kids were really excited to get to pick “their” children. Luke pored over the pictures of little boys his age before finally picking a boy named Andi. In contrast, Anna marched up to the computer, gave the girls a quick glance, and then authoritatively chose Massiel. 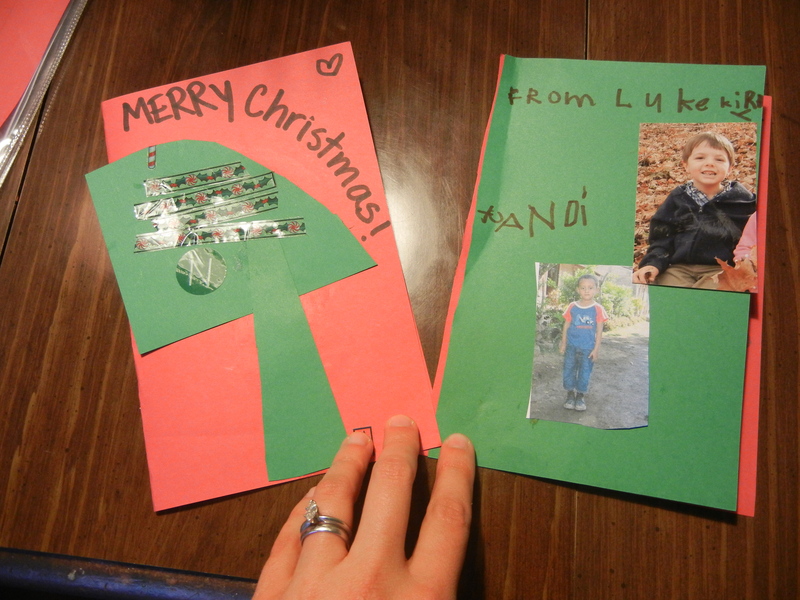 I printed out information on our new kids, and that very afternoon, we got to work on some Christmas cards for them. Unlike some of my less successful attempts to make my kids more “others-minded,” this one went over incredibly well, and the kids did not need any convincing to make their cards. I let the kids write what they wanted in their cards, and I think that including pictures really helped. I know it helped my kids, and I hope it helped Massiel and Andi, too. The information sheets gave us fodder for things to write back to Andi and Massiel. And with Compassion’s website, we found that writing back was super easy. We do it online, and the kids can pick out their own stationery and easily include pictures. Then Compassion prints out the letters and mails them. We try to write them at least once a month and to always include pictures. 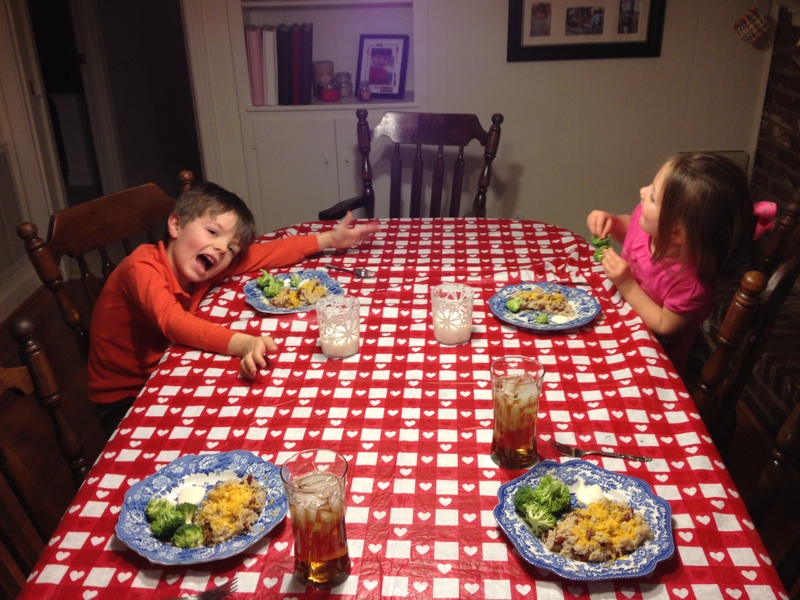 In Andi’s last letter, we shared pictures of Luke eating gallo pinto with cheese, as well as his positive review. The whole process of writing both kids takes about 15-20 minutes. It’s great. 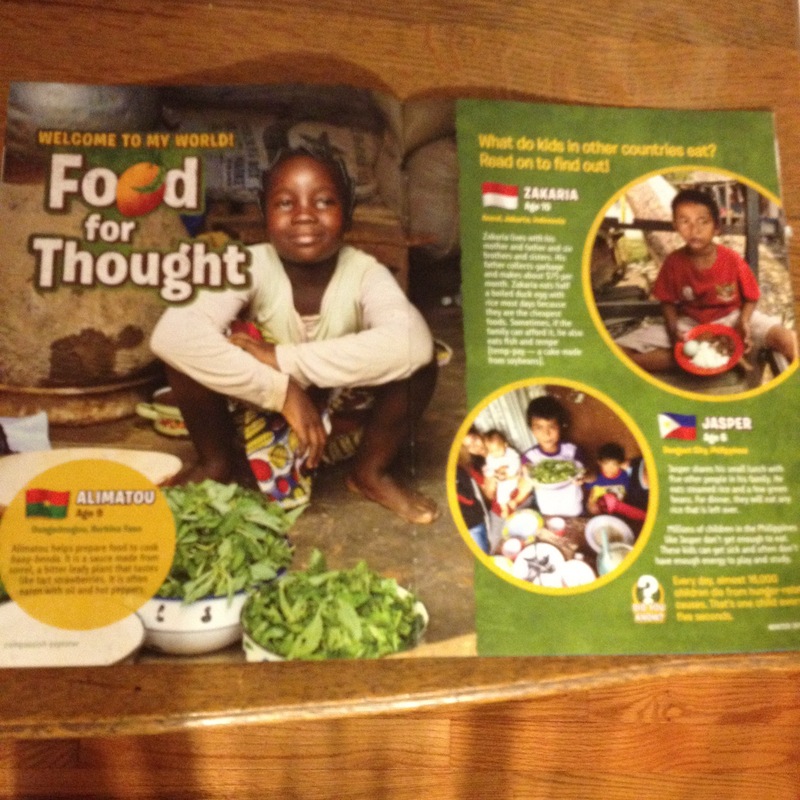 An added bonus to sponsoring through Compassion is that they have a free, quarterly magazine just for kids. It is called Compassion Explorer, and it is a wonderful resource for kids. You can sign up for it online, and it comes with your regular Compassion magazine for adults. The magazine is full of great photos and stories about the lives of kids around the world, and it also has stories of kids helping others. 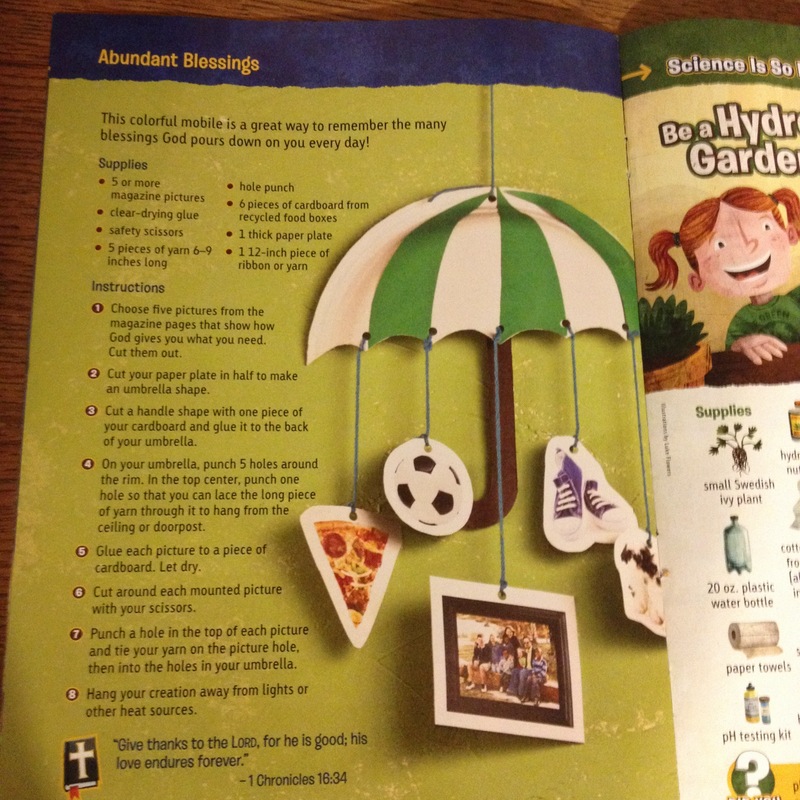 Plus, there are craft ideas, recipes, and science experiments. 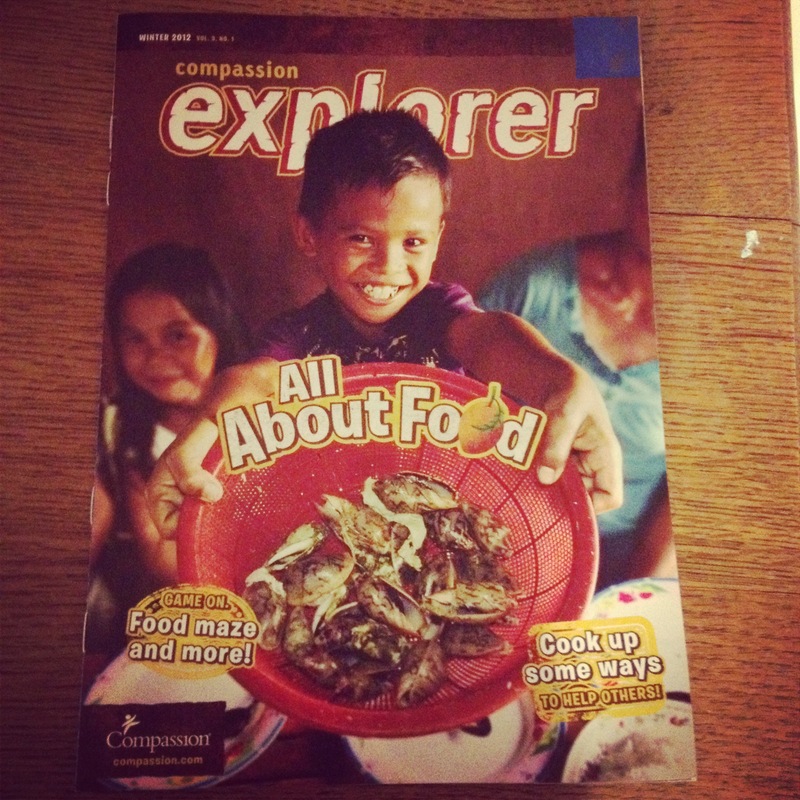 Both the kids and I were big fans of Compassion Explorer. So far, we have loved having Andi and Massiel as part of our lives. We have learned about their lives and their country, and it has given my kids a chance to think beyond themselves and their own world. 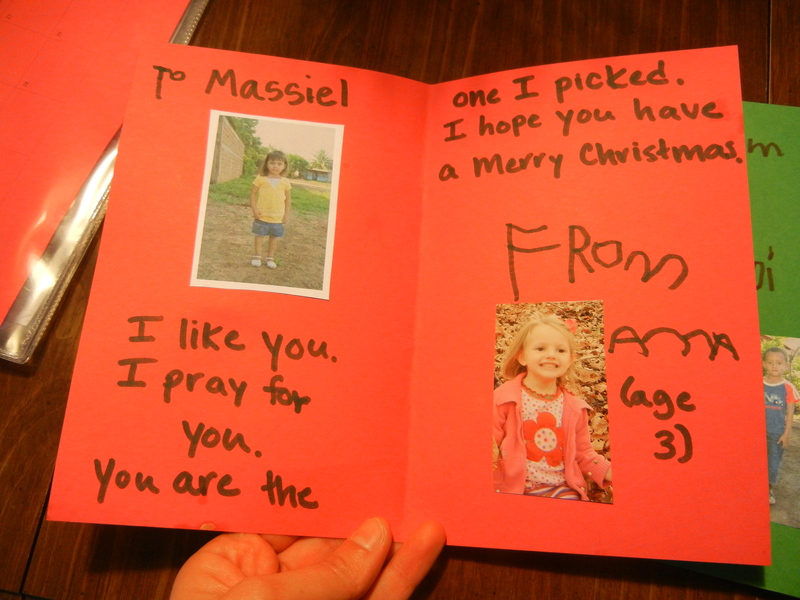 We also pray for Andi and Massiel each night, which brings me to our second teaching strategy. We have always said nightly prayers with our children. Their prayers go in phases. For a long time, they prayed long prayers, thanking God for everything in their lines of vision: ceiling fans, stuffed animals, furniture, and so forth. Their most latest phase, however, has been to rattle off a quick, “Thank you, God, for this day. In Jesus name, Amen.” Usually, I just wait until the phase passes, but this one lasted so long that I decided to intervene. I started by taking prayer requests before we prayed and then divvying the requests up among the three of us. That worked okay, but the enthusiasm was still lacking. I also realized that most of our requests are the same each night. That’s when I hit on the idea of making prayer cards so that we could remember what we were supposed to pray for. 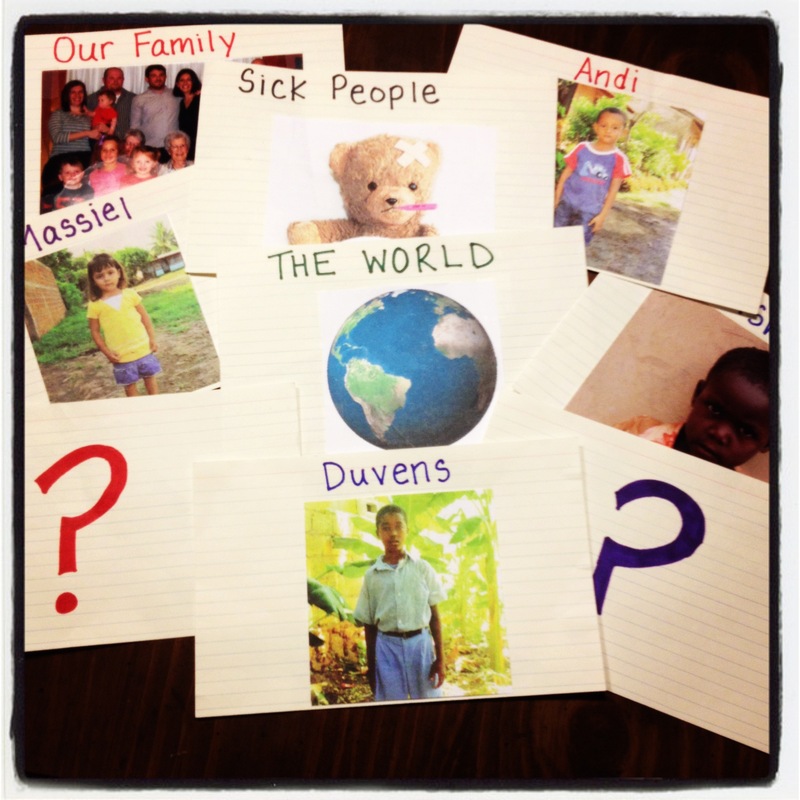 I made cards for the usual suspects: our family, our sponsored children, and sick people. Then I got the idea to make a card for “the world.” It’s funny because at the end of last year, had the strong desire to learn how to pray for the whole world everyday. I’m pretty sure I wasn’t picturing an index card with a globe on it at the time, but you have to start somewhere! I also threw in some “question mark” cards where you could put in your own requests. Amazingly, these cards have been a huge hit with the kids. We have used them for almost two months now, and they love them. We have talked about each card and what to pray for with each one (mainly because Anna’s prayer about sick people started out, “Thank you for sick people!”). The kids love taking turns picking their cards, and it is kind of like a game to us at this point. They have their favorites and sometimes even trade for certain ones they really want. We are still miles away from anything resembling a serious prayer time, but their enthusiasm is definitely an improvement. And I was very gratified last week when Luke hopped into the car after school and announced, “We need to add Mrs. ______ to our prayers. She has missed two days of school!” And he didn’t forget that night, either. Small steps. I’m doing all this in order to make the most of our current environment. Even if you don’t live near a refugee population, like we do, I’m sure there are other ways to acknowledge the diversity of your environment and turn it into an opportunity to teach your kids about others. In fact, I’m interested in hearing your ideas. Okay, now it’s your turn. I would love to hear how you teach your children to be more small-world-, missions-, others-minded. Do you have any tips or experiences to share? I loved this! And thank you for all the info on Compassion! Sam and I had decided to sponsor a child for Adelaide’s upcoming birthday–someone her age–in part because we wanted to give her a more tangible connection to this idea that the way we live, with food in abundance and STUFF that’s not often necessary, is not how everyone lives. Somehow I had not considered actually letting her pick! I think that’s going to make this even better! I hope you know that you inspire me daily, both in my Christian walk and as a mother. Thank you!! Thank YOU, Drea, for the kind words. I am eager to hear about how Adelaide’s experience with Compassion works out! ah the blessing of Godly parents – there are no words to describe how much a blessing it is for children. U guys are amazing – thank you Lord for Kim and Greg and the blessing they are to their children. continue to shower them with Your grace and mercy and much wisdom as they provide a Godly home for their little ones. may their children follow in their steps and serve you all the days of their lives. in Jesus name, Amen. Wow–thanks, Mr. Gardner! We certainly appreciate all the prayers we can get! Kim, I love the gallo pinto and praying for sick people stories! And I beg to difffer, it sounds to me like your kids are already engaging in some serious prayer time. When our kids were young, just a bit older than yours, my wife started doing prayer time with them while driving to school in the morning, praying for the day ahead of them. This expanded to praying whenever we all went somewhere on the road together, whether to church or errands or vacation. If it was the first car trip of the day, it started with prayer. We still do this, and when our son and his friends came home from college the other weekend she prayed as we drove everyone into Sacramento for some shopping. A few days later we got a thank you note from the three friends, and one of them specifically mentioned how much she appreciated being in a home where someone prayed over her. Another way we tried to show our kids that church was not something to avoid or resent was to let them explore non-traditional things to do there. Our son got really bored with 4th grade Sunday School and wanted to stop going to church altogether. I suggested he might like to attend the High School class I co-taught. He bought in and attended there the rest of the year. The next year he still didn’t want to go to his own Sunday School class, but asked if he could volunteer in the nursery instead. Fine by us, and that’s what he still does some weekends when he’s home from college. We also started taking the kids with us on Mexico mission trips with the High Schoolers in the Spring. Kyle started when he was in 5th grade, and two years later Jenna joined us in her 5th grade year as well. They came along with us for years, working alongside the adults as best they could. Then when they joined the High School group they were team members in the youth ministry teams. Now they both have a ton of overseas ministry under their belt (Vietnam, Slovakia, Israel, etc.) as well as repeated stints with inner city ministries. Does it sound like I’m bragging on my kids? Well maybe, but I hope that like Paul my boasting is in the Lord. It is amazing to see what God has wrought in their lives. There’s no way they would have come to this point if it had relied on me. And I don’t want to give the impression that there was no resistance along the way, because there was. We did our best to pick the right battles (“Yes, you have to go to church this morning”) and let others go (“It’s up to you whether to go on the Mexico trip this year”). I don’t know whether any of this is helpful, because it sounds like you and Greg are doing a wonderful job already! Tim, thanks for all the good advice and suggestions! I love the idea of praying when you first get in the car in the morning. My mom used to pray with us before every long trip, and sadly I only remember to do that sometimes with my kids. We do try to pray whenever an emergency vehicle passes us with its lights on. But I love the idea of praying each day even more, especially before Luke goes to school. Also, I like the idea of exploring non-traditional options and picking your battles. I worry that I have a tendency to be too strict. On Tuesdays, for instance, I take the kids up to Y.E.S. so I can serve dinner to the kids there. I usually let my own kids play and then fix their plates for them so that they can eat while I serve, but this week, the woman in charge suggested that they help hand out dessert. Anna was all for it, but Luke didn’t want to. I decided to not to force him, but I did make him wait to eat with Anna and me. I wondered at the time if I should just go ahead and let him eat, b/c I didn’t want him to think I was punishing him for his choice. I really want my kids to WANT to serve. So yeah…it’s sometimes hard for me to know which battles to fight. That’s why it is so nice to hear from parents who have already walked down this road. And PS….your kids sound amazing! In our morning staff devo today, the topic was, ironically, the importance of passing along godly wisdom to your children (and, likewise, respecting and listening to the advice of your parents). I couldn’t understand all of it (since it was in Spanish), but I did get that he was talking about Solomon. 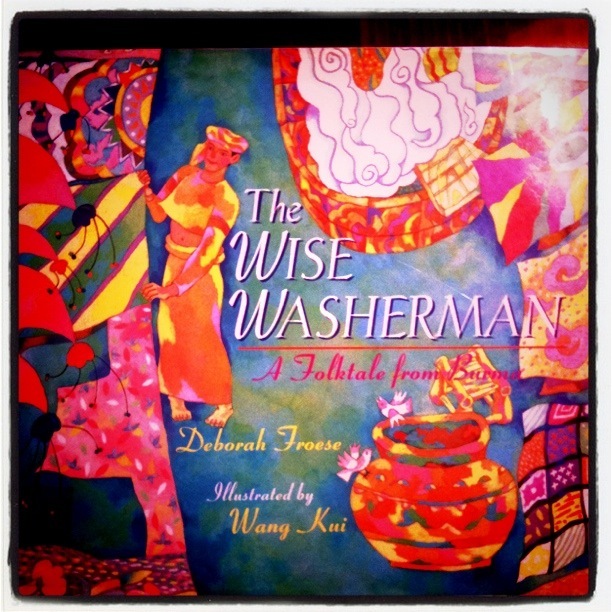 Solomon sought wisdom, and he received it (from God, from his parents) and passed it on. I guess one of the most important things one can teach to their children is not only the specific things they need to know but how to figure out what the truth is and to have a hunger for that truth, for who God is. For example, I like that you seem to be more concerned with the heart your children have for prayer than with what they actually do when they pray. Of course, it is much easier to give specific information than it is to conjure up a hunger in someone else, but (and I’m just thinking “out loud” here–again, I don’t actually have children) how would you make someone hunger for food? You would probably describe the food in detail, making it sound really appetizing, and maybe you would describe the empty space in their stomach and how they would feel much better if they would just eat the food. Maybe there is a way we can do the same thing with God, talking about His qualities (in real life, like you said, not just at church) and presenting Him as the solution when something is wrong and there is an empty space inside. Coming up with cool little activities and stuff can surely help with this, but I think even just talking about it in the moment when life happens is totally valid too. Becky, we would love to visit you guys in Nicaragua at some point, and we do plan on it…it’s going to be a little while before we can, though. Right now, I feel like we have all the time in the world, b/c five years is never going to end…right? :) In reality, it would be the next summer at the earliest before we could come. But yeah–I totally hope to visit. For one thing, I agree with you that it would be great for the kids…but also, I’d just love to see you guys and all that you are doing:). Yeah, I figured it was an “eventually,” kind of thing, but hopefully when you do come we’ll be even further into our projects and there will be more good stuff to see. But, we’ll be glad to see you whenever it happens. BTW, if you or the kids ever have any questions about Nicaragua that I can answer (or if you would like a picture of something in particular–or whatever), just let me know. Kim – I hopped over here from Compassion’s blog. I love all that you are doing with and for your kids. I have the same passion and as a result started a blog called “Compassion Family – Celebrating, Experiencing and Sharing the Joy of Sponsorship as a Family”. My early posts feature a lot of resources for kids and ideas of how to involve the whole family. We have a lot of Compassion kids and I made prayer cards for my girls – they have been a great way for my girls to focus and learn about each of our children – not just pray for the Compassion kids in general. Jill, thanks for stopping by! I poked around your blog and enjoyed it as well. It is so cool to see others so fired up about sponsoring kids! Wow this is all great stuff. Worrying about this on a personal level is still about a decade out, but I hope resources as good as this will be present for me at that point. In lieu of my own parenting experiences, might I encourage you with my experience as a child? My parents played a critical role in my christian formation, but it is really God and his unusual ways that have formed me. My habit of service started when I was about 12 or 13 at church camp. I didn’t know many people there, my counselor was quite annoying, and jr high aged boys can be horrible jerks. All of this contributed to me spending as little time with my age group as possible. I ended up spending a lot of time helping the younger guys with camp chores. Pretty soon I realized that this was a great escape from a crappy cabin, all the 10 y/o kids adored me, and all the adults praised my “servant heart”. Even though my motivations weren’t in the right place, God was forming life-shaping habits. Now lets fast forward a few years to about 14. I’m working with my youth group, volunteering at a camp called Camp of the Hills. Our primary job is food preparation and service for the campers there. We each have a cabin to serve waiter/waitress style. One of the counselors at the table I was assigned to is horribly allergic to everything. I mean I can kill the guy in his sleep with an egg, a spoon of peanut butter, a small glass of milk, or a can of mixed nuts before he even wakes up. Needless to say, dessert items are out of question for him (except for his jello, nobody touches Drew’s jello). He reasoned that since everybody in his cabin couldn’t have seconds on dessert, it would only be fair if he gave it to the server. At the time I was old enough to realize he was just trying to give me an extra cookie, but young enough where that was super cool! I learned to associate Camp of the Hills with really cool people who give extra cookies. The next summer I decided to make a deeper commitment at Camp of the Hills and I’ve been spending my summers there ever since. Hi, Ben! I totally agree about God showing up. Sometimes I worry that my overzealousness in teaching my kids might even be a liability in the long run, as it might make them jaded to all my little spiritual schemes. Ultimately, though, I have faith that God hears my prayers for my kids and that HE will use my efforts to lead them. Your story about your camp experience reminds me of how my parents used to always make us help this old man, Mr. Arthur, who was in charge of the Care Building at church. Normally, we liked sorting food for Mr. Arthur anyway, but he always made it more special by giving us treats and stuff. Even so, one Sunday night, I was supposed to help Mr. Arthur after church, but I fell asleep in the service and woke up in a murderous mood. It was SUCH a bad mood; I was mad at the world. And I certainly didn’t want to help in the Care Building. I was mad when my mom made me go anyway. Well, something happened while sorting and bagging food: my horrible mood quickly melted away, and I even became happy! It was such an unprecedented transformation that I went home and wrote about it in my journal: I had found the secret to happiness, and it was in serving other people. I don’t have the journal anymore, but I remember that experience clearly. My parents could not have orchestrated such an experience: they simply arranged the service opportunity, and as you put it, God showed up! Thanks for stopping by and offering your perspective! I stumbled upon this blog while trying to find a link to sign a friend up for the Compassion Explorer magazine. I am always happy to find another blogger who is passionate about Compassion! This is a great post!